Apr.. 5th. The day started out slow and I was running out of time on this 3/4 day trip. We caught bait and then caught a shark but the bait was hard to catch. Right before having to head home we caught double baits and turned that into double sharks. April 4th. We targeted ono in the morning and caught two. We went to “The Grounds” and caught 3 tunas. Using some tuna meat for bottom fishing we went 1 for 2 and got this shark. April 2nd. Just one ono today. The water was too rough to go to my bottom fishing spots. We didn’t see much life out trolling on this short trip. April 1st. This ahi tuna played an April Fools joke on us and ate the smallest lure behind the boat. It had only 40 lb. test line and the tuna weighed 75 lbs. It took an hour long fight to get it in and we thought we would break the line any moment. Who got fooled? 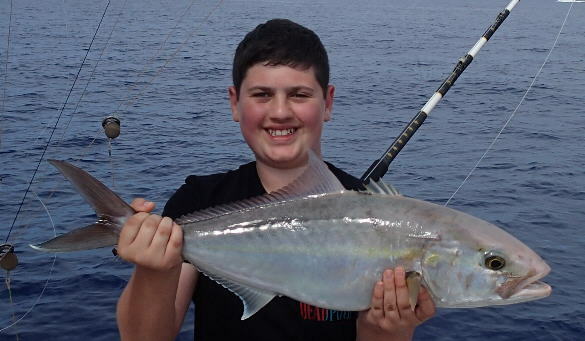 We also did some speed jigging and caught and released 3 amberjacks. Mar. 28th. The tunas wouldn’t bite today but the mackerel did. I used the mackerel for bottom bait and got this shark. Mar. 26th. One of the best things in life is fresh tuna. One went to the dinner table and the other one went to a sushi bar. Mar. 25th. 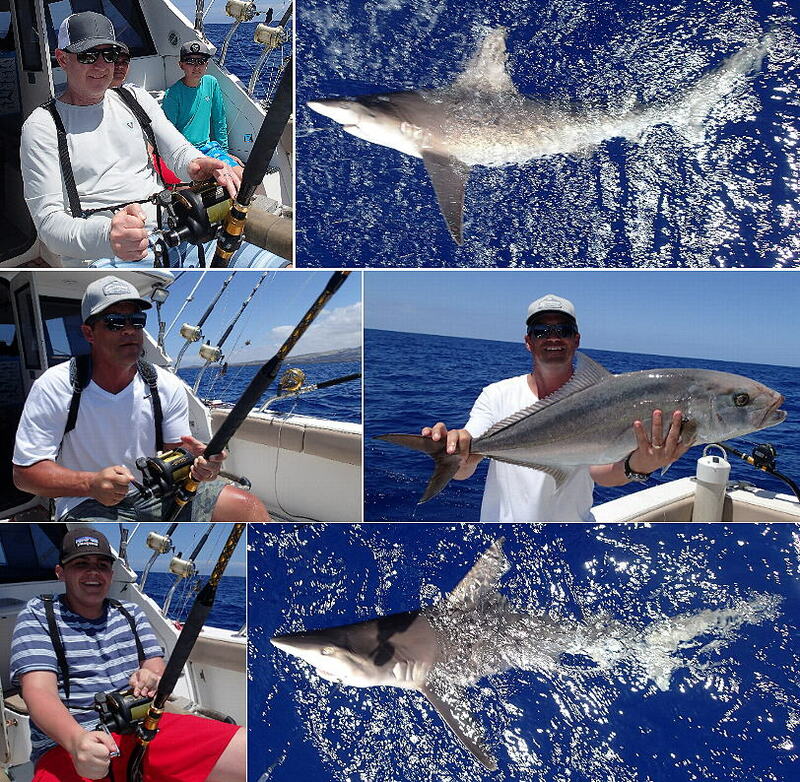 Another successful trip with an amberjack and a shark because bottom fishing is almost always successful. Mar. 22nd. It didn’t take long to find some bait fish and I tried live baiting the surface for a while with no luck. I knew dropping live bait to the bottom would most likely get us some fish. I didn’t know that all 3 would be sharks. The first one was only about 50 lbs. The next one was close to 200 lbs. and the last one at 150 lbs. broke leader before getting a good pic. Mar. 18th. Soon after finding a couple of mahi mahi (got 1 lost 1), the wind came up and we had to leave the area. 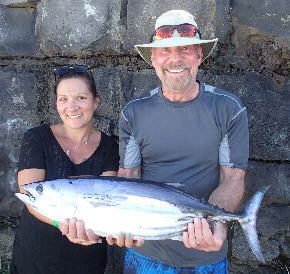 Later in the day next to the fish farm, we scored this ono. Mar. 15th. The kids caught bait fish and dad hauled in an amberjack using that bait. Mar. 12th. Not many fish are being caught while trolling. Speed jigging is still working. We scored a double almaco jack, 2 on at the same time and a goat fish for the dinner table. Mar. 11th. Since I had so much success jigging last week, and the trolling bite wasn’t working, I went to one of last weeks hot spots. We scored an almaco jack and an amberjack. Mar. 4, 5, 7 and 8. These guys came from Germany on a speed jigging expedition. 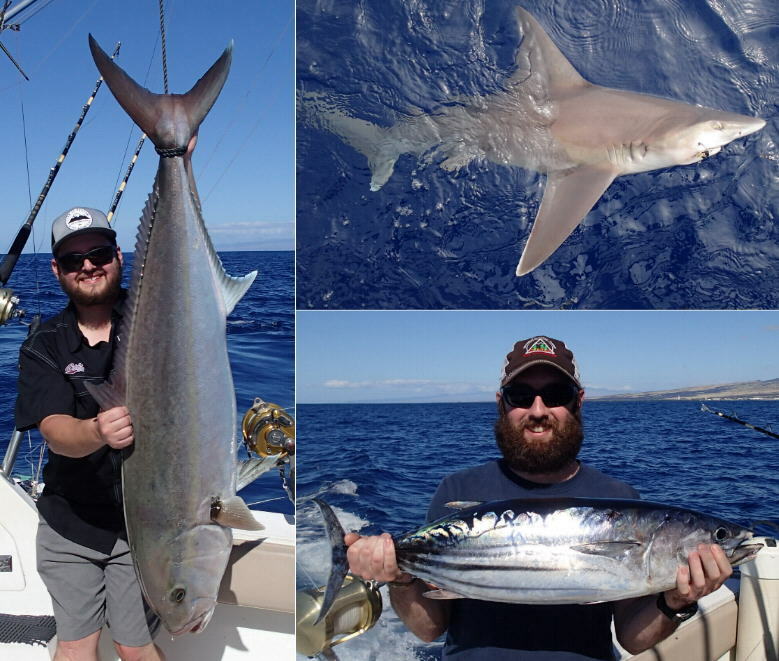 Of course the spearfish was caught while trolling and so was one of the ahi tunas but we spent most of the time jigging. 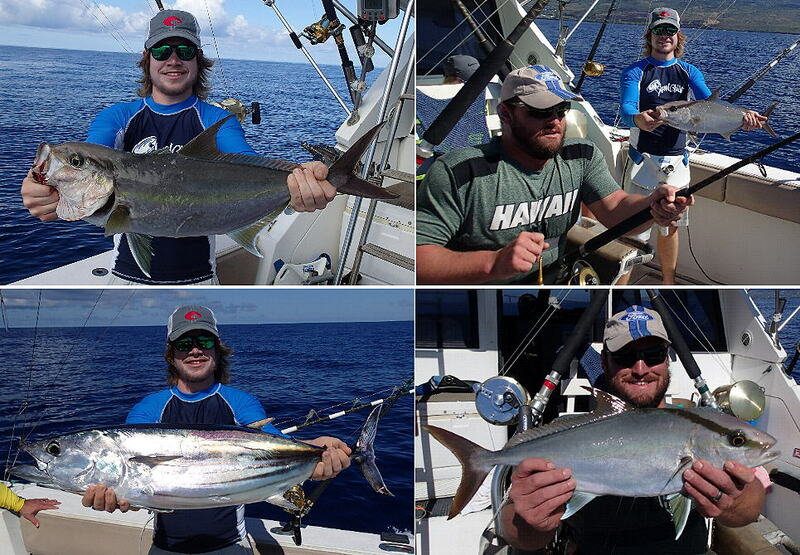 We caught 2 of the ahi jigging along with several almaco jacks. We also caught goat fish, hog fish and 2 different kinds of snapper. Feb. 26th. Another “WOW” day. 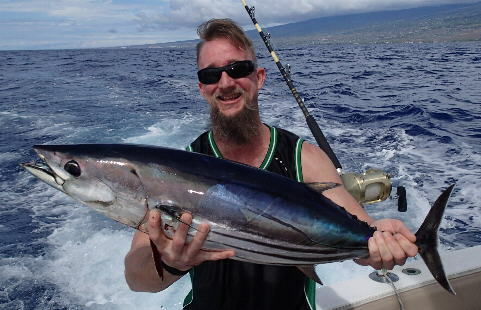 We got a spearfish trolling “in the blind” and then we caught an ono near the fish farm. 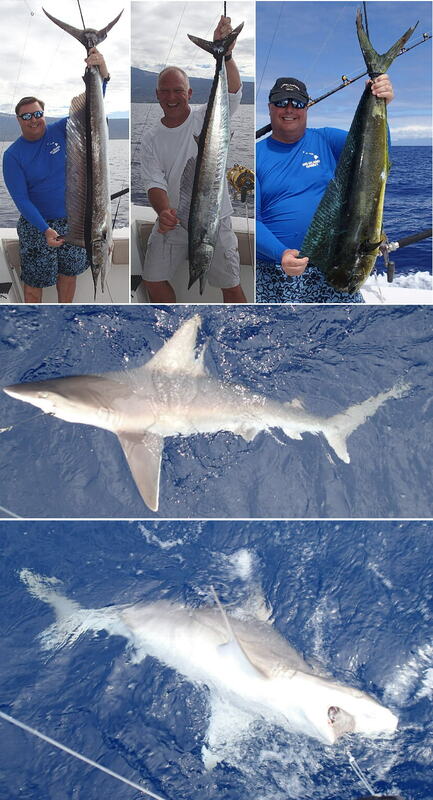 I went to my bottom fish honey hole and we scored 2 sharks. Trolling for the rest of the day we picked up a mahi mahi. Feb. 25th. The same spot where we caught and released 3 sharks just 3 days ago but today, we had to wait a long time to finally get one. Feb. 22nd. 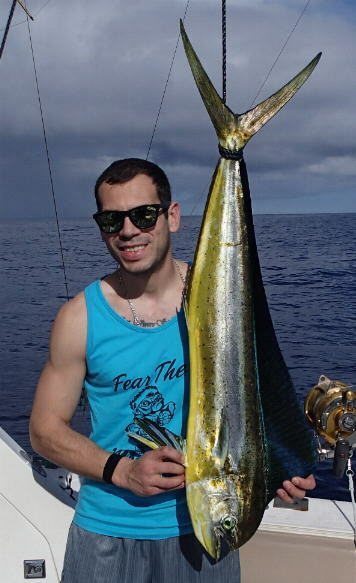 I finally got my first spearfish of the season and we backed it up with a mahi mahi, both while trolling. The bottom bite was even better with the catch and release of 3 sharks. Feb. 21st. 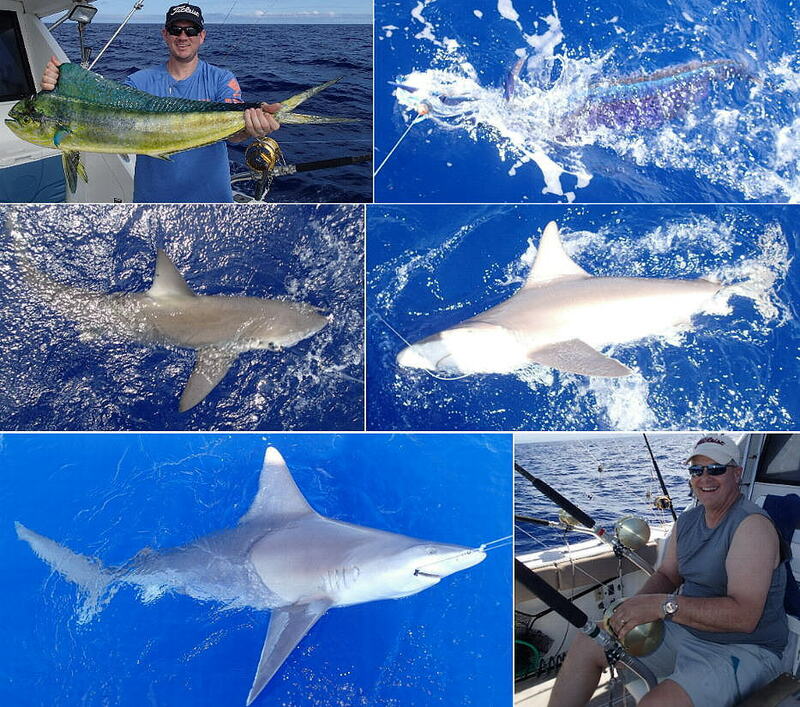 A couple of shark catch and releases made for a fun time for this father and son team. Feb. 14th. 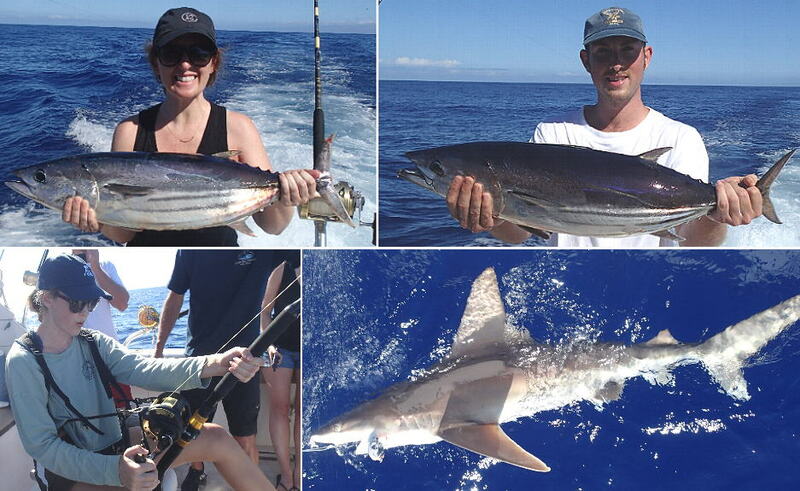 A small ahi tuna for the dinner table and a shark for the fight of it. Feb. 7th. Again, these otaru tunas aren’t even suppose to be around at this time of the year but for some reason, I keep catching them. Jan. 31st. 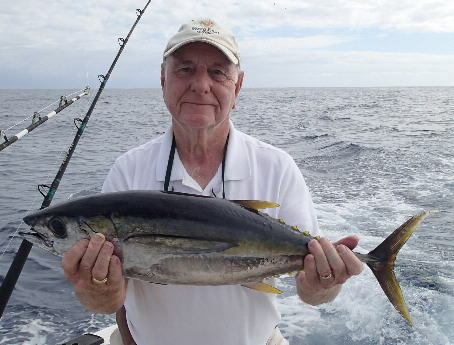 The tunas were biting near the offshore fish farm. 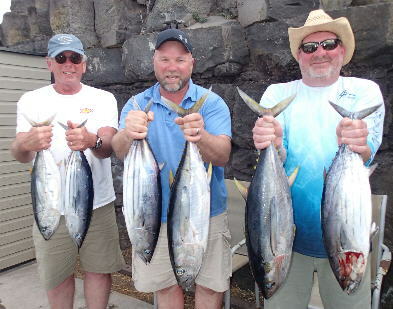 We caught a combination of ahi and “chunk light” tunas. Jan. 25th. Almost a duplicate of my last trip. A 100+ lb. amberjack and 2 sharks. Jan. 22nd. The bait fish were easy to catch and the bottom bites were pretty much instant! 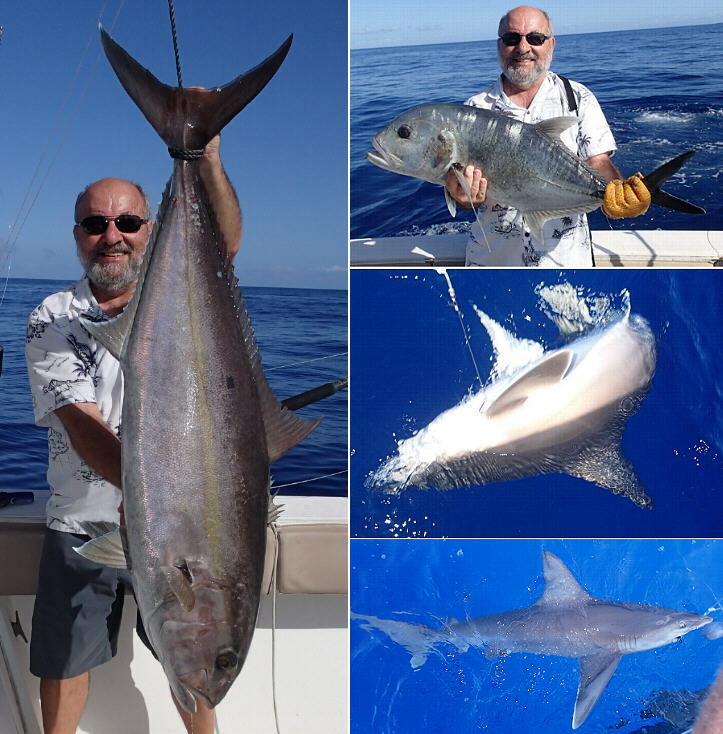 The giant trevally was our first fish followed by a big amberjack and then a shark. Time to go trolling to rest up from all the action. We went bottom again and got another shark. We pulled hook on another fish. 2 bites while trolling but neither stuck. Jan. 21st. This was a share charter with 2 couples. After catching some mackerel for bait I went to the bottom. We caught and released 2 sharks and had an amberjack bite. Then a tiger shark moved into my spot and everything we hooked up was instantly eaten by it so we went trolling for the rest of the day. Jan. 18th. We spent most of this 6 hour trip trolling but it looked like if we kept that up, we were going to get skunked so I decided to do some speed jigging. We went 1 for 2 on amberjacks. Jan. 15th. 100+ lb. amberjacks are rare and put up a very hard fight. This one was about 120 lbs. We released it and also a shark. I filleted the tuna for the dinner table. Jan. 14th. 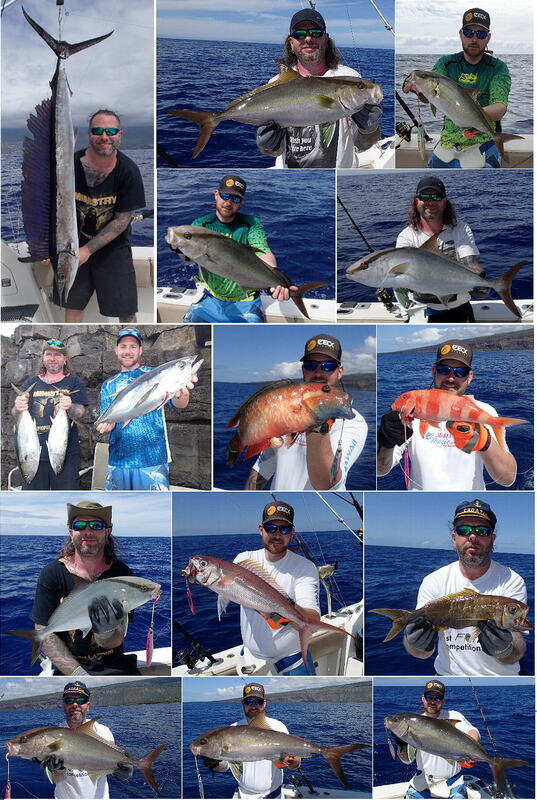 A busy 3/4 day on the water. 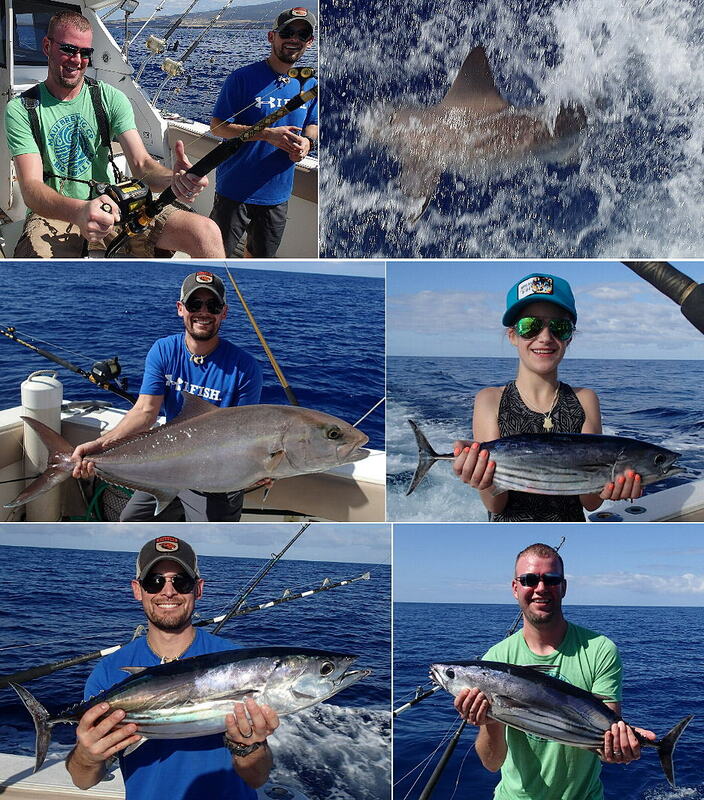 The tunas were a bit hard to catch but we managed a few. Sending tuna chunks to the bottom we scored a shark and an amberjack. Both photo’d and released. The two bigger tunas went to the dinner table. Jan. 11th. While making bait for bottom fishing, a marlin ate one of our baits on the way in and got hooked. 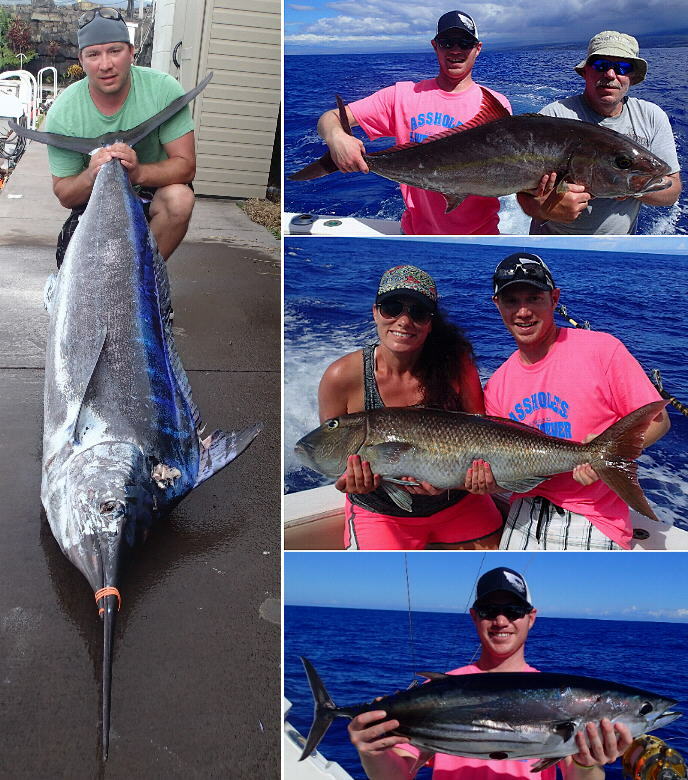 I knew we didn’t have much of a chance because the marlin was well over 100 lbs. and the leader was only 50 lb. test. It broke off. We caught and released an amberjack. 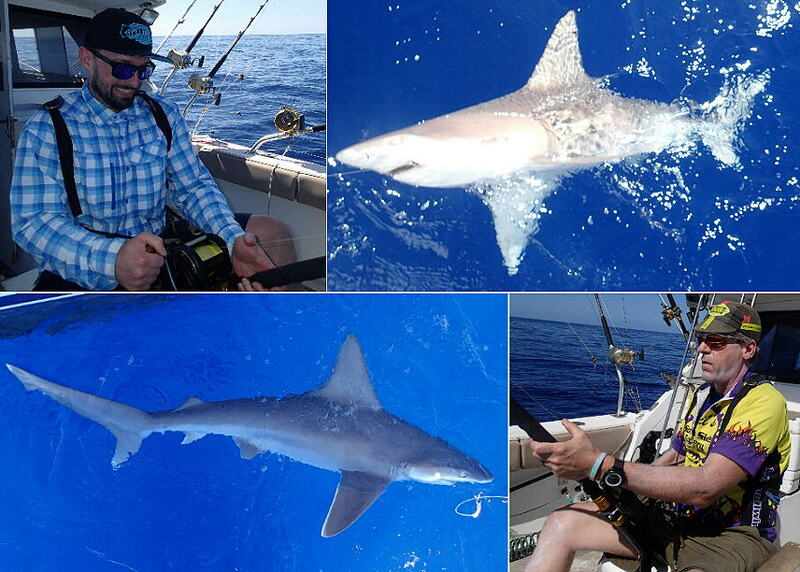 We also hooked a HUGE tiger shark but the hook pulled out before we could get it to the boat. We did see it though. Jan. 10th. The water was rough up North and going South, I couldn’t find any bait fish so we did some jigging. We caught 3 almaco jacks and we lost another 3 fish. One was so big it snapped the hook! We caught this otaru tuna (“Chunk Light”) later while trolling. Jan. 8th. OK, not every trip results in multiple fish or even big fish but i work hard to catch something. We caught and released this amberjack. Jan. 4th. I seem to be on a roll. 3 marlin in 3 trips. We actually had 3 marlin on all at the same time on this trip. One came off right away. The 2nd one we got in the boat. 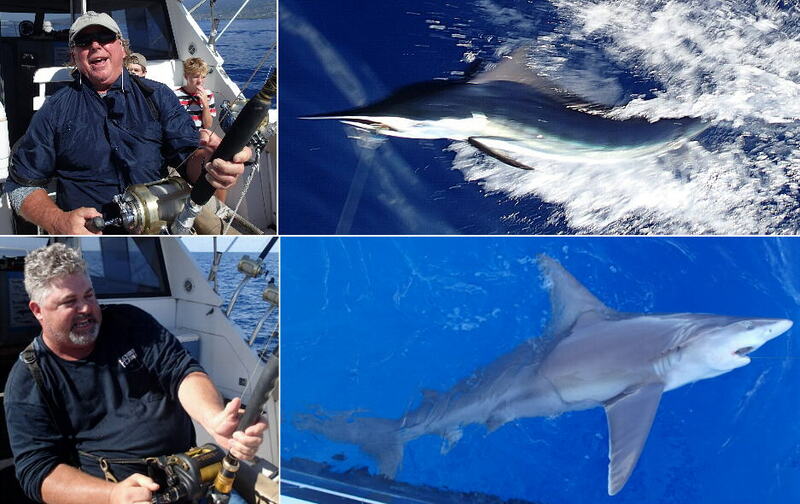 The third one was on stand-up tackle and the marlin shook the hook out right behind the boat. Jan. 3rd. A great way to start the new year! I went to one of the FAD’s looking for tuna and found this marlin hanging around there but no tunas. We went to another FAD and found a couple tunas but only got one in the boat. Dec. 31st. A great way to wrap up 2018! We were heading to one of the FAD’s for some tunas when we caught this mahi mahi on a new lure that I had just rigged minuted earlier. 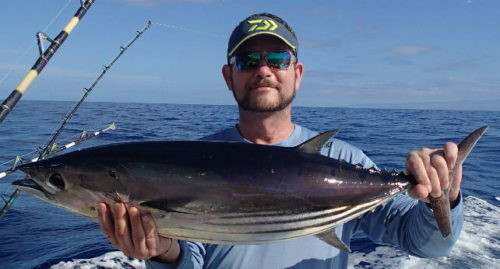 Before I could even get all of the lures back out we hooked up this striped marlin. Good thing because there were no fish at that FAD. 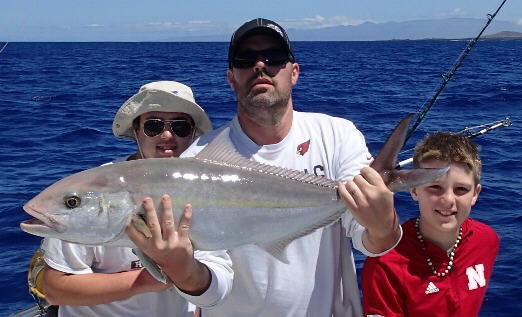 We later caught several small ahi tunas on another FAD. No luck bottom fishing. Dec. 28th. These tunas shouldn’t even be here at this time of the year but I’ve caught them on the last 3 trips and always in the same area. These tunas are mostly meat! We tried some bottom fishing also but didn’t catch. That’s also a rare event. Dec. 27th. It’s not the season for big skipjack tunas (aka ‘chunk light’) to be here and we had several hook-ups but most were biting light and coming off. We got 2 of them and a shark by putting fresh caught mackerel on the bottom. Dec. 21st and 24th. 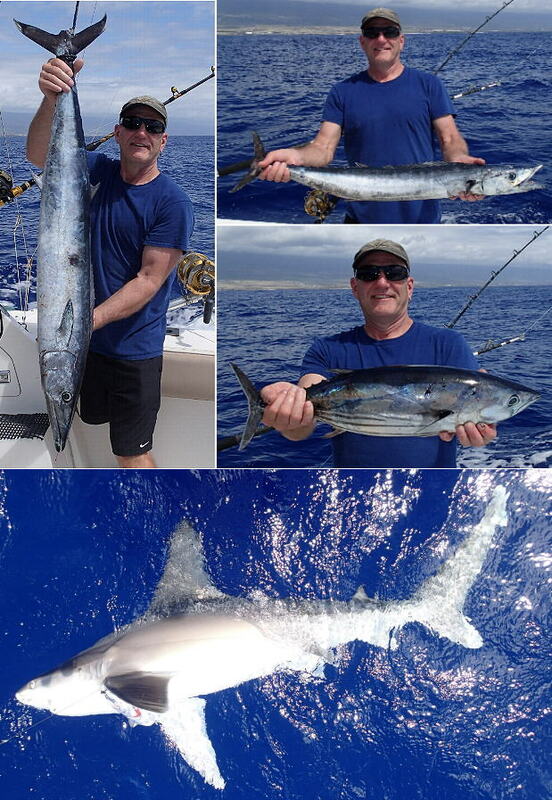 After catching several small ahi tunas for the dinner table it was time to go after some bigger game. Shark of course. On the 24th, the high North winds finally calmed down so I was able to go to my favorite fishing grounds. 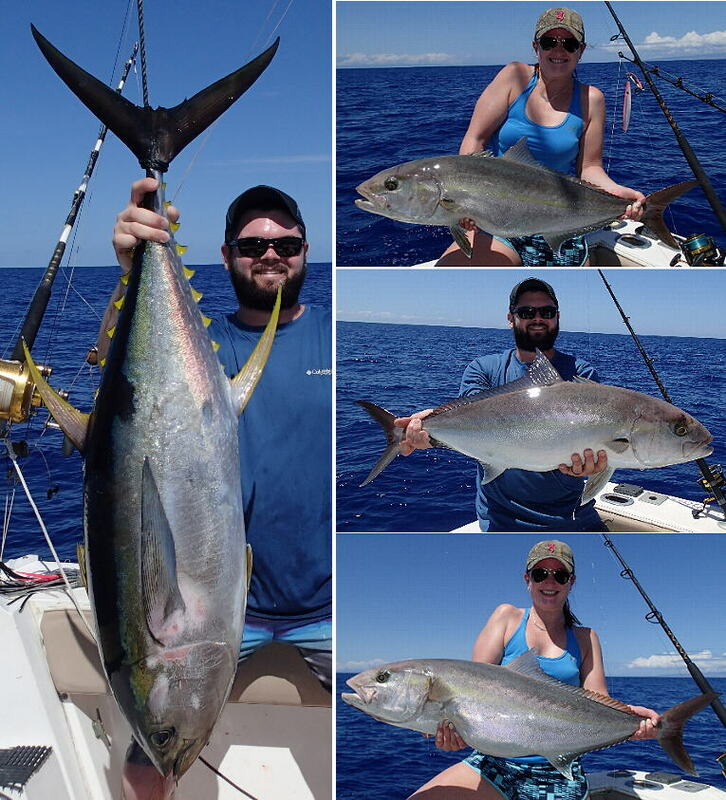 We found some bigger tunas there but didn’t have any luck bottom fishing. Jan. 3rd. Hitting up one of my new “honey holes”. Mostly sharks in there. Nov. 26th. We caught fresh bait and went to the bottom. I catch more sharks than anything else lately. Nov. 23rd. We got into some 40 to 60 lb. ahi tunas and had a few bites but none of them would stick. Right after leaving the area we got hit on that same lure so I thought it might be an ahi but it turned out being a baby blue marlin about 60 lbs. that hadn’t even grown a nose yet. I let it go so it would grow up. To the untrained eye, people might think this was a shortbill spearfish but I know better. 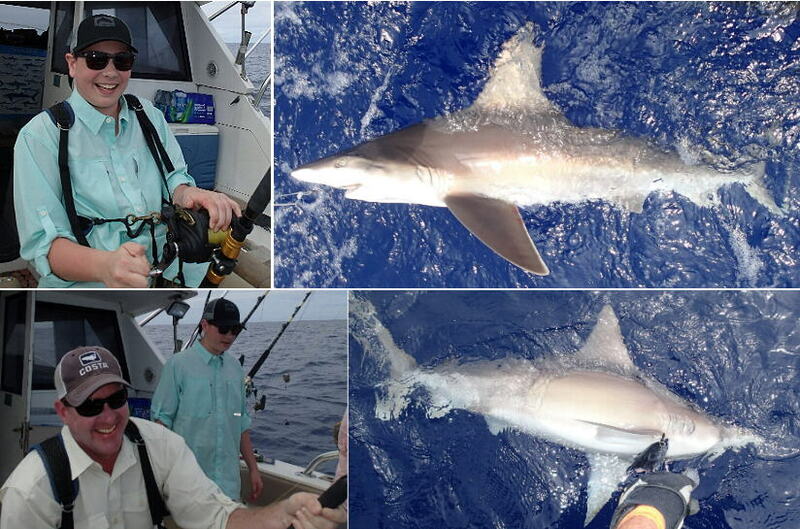 We also caught and released this 100 lb. shark. Nov. 20th. It was too rough to get to my favorite spot up North so I went to my favorite spot to the South. 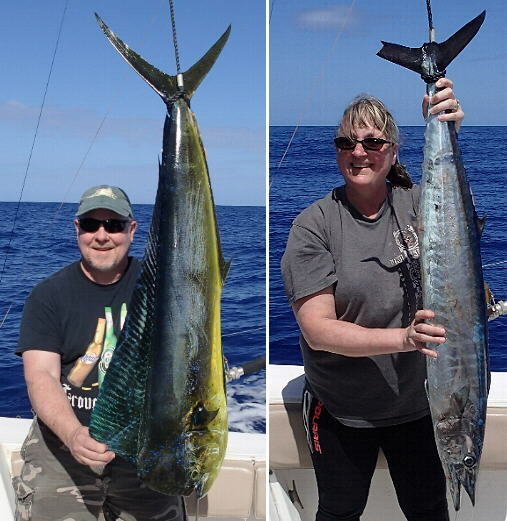 Patrick and his wife were looking for tunas to make ahi poke. They weren’t disappointed. I also dropped some meat to the bottom and caught this almaco jack. Nov. 16th. I went to my usual spot where I’ve been catching the otaru tunas and they weren’t there. I decided to head to one of the FAD’s and found the school way offshore. We went 3 for 4. No one has caught any ono in quite a while here. Usually ono are caught near shore but we caught this one offshore. 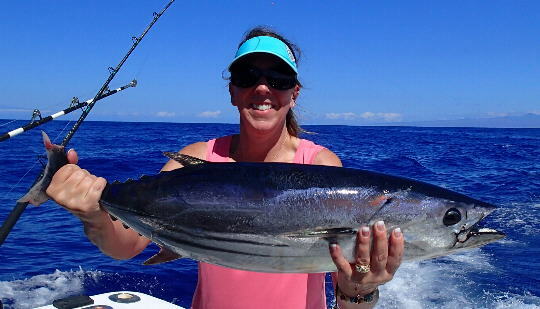 We also went to a FAD where we caught a few small ahi tunas. 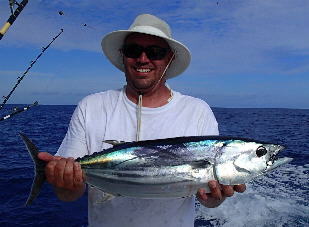 David wanted his wife to catch this tuna but it proved too strong fro her to get in so David had to finish the fight. 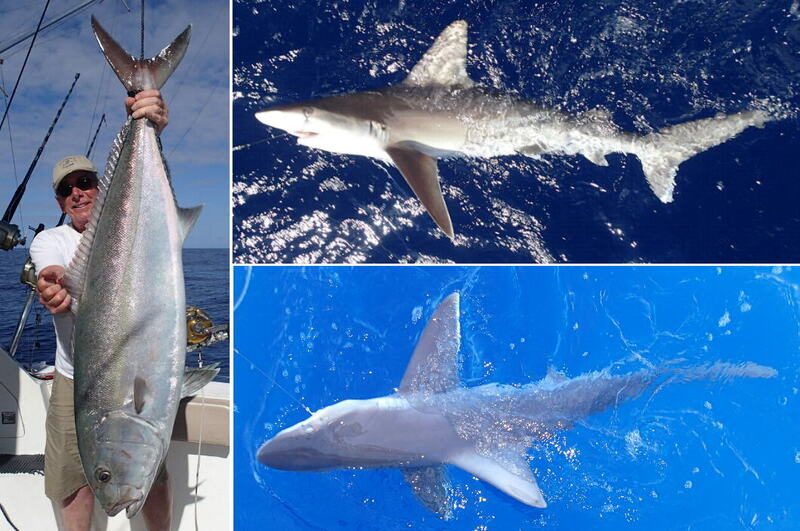 He also caught and released this shark. Still the #1 catch of the day is tunas. We only got one today on this 3/4 day trip but that’s better than nothin’. Nov. 6th. The otaru tuna bite is still going strong but soon the water temperature will cool down and they’ll be gone. We also caught some small mackerel to drop to the bottom and were rewarded with this shark. Nov. 2nd. 100+ lb. 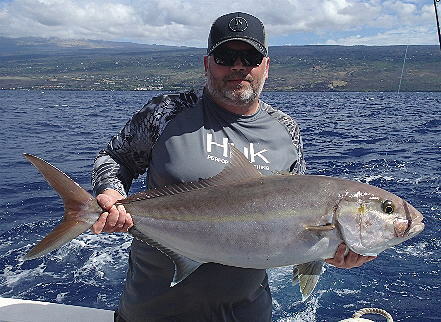 amberjack are a rare catch with maybe getting one or two in a whole year. Today was a first! We caught two over 100 lbs. back-to-back. Oct. 30th. 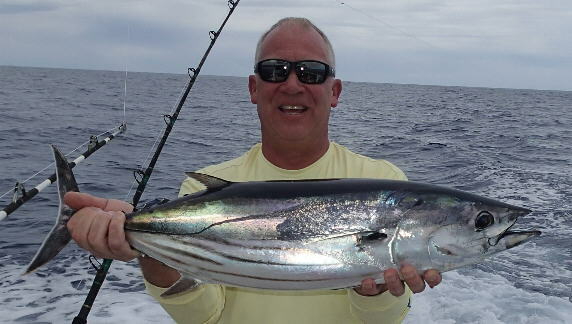 The tunas are still biting. 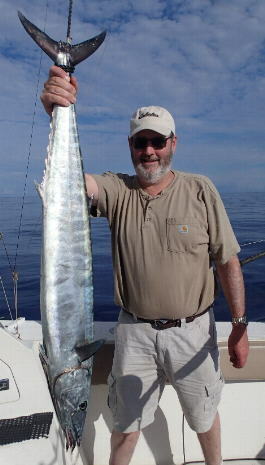 We also caught and released a barracuda. Oct. 29th. The tuna bite is going good up North. They’re not showing on the surface much but they’re there. Oct. 23rd. The first fight of the day was a tuna that pulled hook right before it got to the boat. We got the 2nd one. Sending a mackerel to the bottom we caught and released this shark. Not bad for a short trip. Oct. 22nd. A busy day with lots of action. We had 2 marlin on. Got one and lost one. We got 2 tunas. One good size and the other, not so much. Going to the bottom we went 2 for 2 with the catch and release of an amberjack and the 2nd fish is the biggest gray snapper I’ve ever seen. We caught mackerel and sent them to the bottom where we scored a galapogos shark and a giant trevally. Oct. 9th. Sharks are a specialty of mine. They’re usually quite large and fight real hard. Shark identification can be a little difficult because they look so similar. 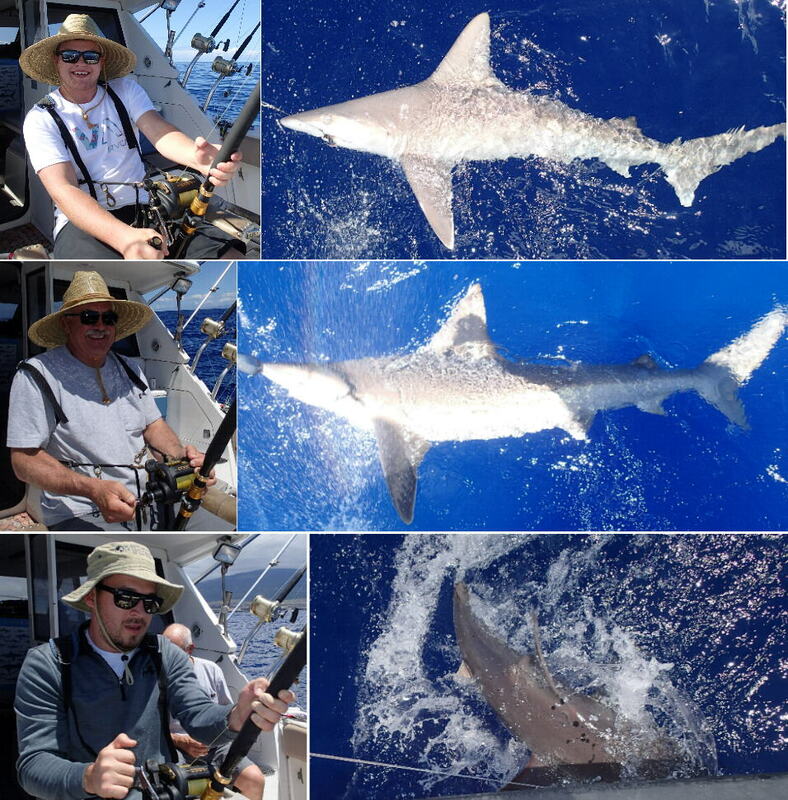 I told Jim that his shark was a bignose shark (top photo) but after examining the photo close up, it turns out that it is actually a silky shark. The bottom shark is a galapogos shark. Oct. 4th. Again it’s the bottom fishing that got us the big ones. 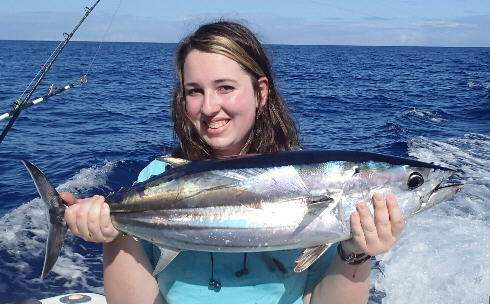 While trolling we caught some small tunas, the perfect bottom bait. 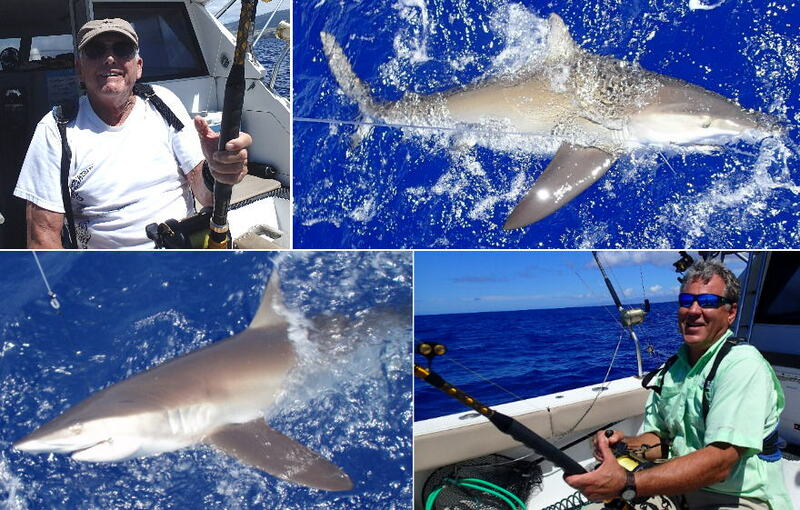 First on the line was an almaco jack and next up was a sandbar shark.